A PAIR of budding Byfleet gardeners were blooming with delight when their blaze of beautiful petunias won first prize in a garden competition. 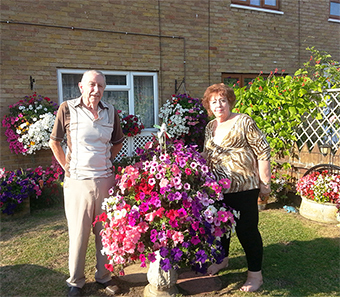 Arthur and Carole Simpson, who have both lived in the area for well over 30 years, had never entered the Woking in Bloom competition before they came first for New Entrants. Their flourishing front garden in Petersham Avenue also came third in the Small Front Garden category. Arthur said: “We were delighted – it makes you feel like doing it again. The couple, who got together after both losing their partners, and were married two years ago, have now been invited to Woking Mayor Tony Branagan’s do next month at the HG Wells Centre for the prizegiving.